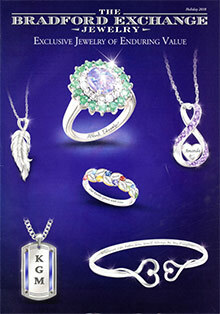 Personalized fashion jewelry and watches for men and women, exclusively from the Bradford Exchange Jewelry collection. Personalized - The Bradford Exchange helps you create one-of-a-kind jewelry and treasured tokens that can be expertly etched with any special names, dates, stories and sentiments that are close to their heart. Choose your perfect personalized gem or jewel from an effervescent assortment of rings, bracelets, earrings and pendants that can be customized for any loving couple, recipient or occasion, from Mother's Day to Weddings, Graduations to Golden Anniversaries, and more momentous milestones. Relationships - Celebrate your unique bond with jewelry inspired by and designed to honor the most cherished relationships in your life. Shop by gemstone, relation or theme with striking birthstone, diamond and heart shaped stunners presented in gorgeous gold and sterling silver settings that will delight any daughter, mother, sister or wife. Explore a dazzling menagerie of charm bracelets, rings, watches and pendants that will appeal to every generation represented on your family tree. Women's Jewelry - Give her a gift that she will always remember with beautifully handcrafted beads and baubles that are truly unforgettable. Browse a bewitching collection of birthstone and charm bracelets, stunning stud, hoop and drop earrings, romantic rings, dramatic sparklers, and whimsical themed jewelry pieces that will pay tribute to her favorite pets, inspirations and interests. Men's Jewelry - Spoil him on his next Birthday, Father's Day, Christmas or Graduation with bold men's jewelry styles that will help him salute his favorite passions and pastimes. From sports and military themed rings to masculine dog tag chains and arrowhead pendants, you'll find the perfect Bradford Exchange piece that will fill him with pride, every time he wears it. Watches - Adorn their wrists with a tasteful selection of men's and women's watches that are meticulously handcrafted, infinitely elegant, and designed to serve as cherished keepsakes now until the end of time. Shop by theme, style or material from a handsome collection of commemorative wristwatches and collectible pocket watches for men, timeless timepieces for women and girls of all ages, with a selection that includes engraved sentiments that will add an air of refinement, a touch of warmth and everlasting charm. Explore the Bradford Exchange Jewelry collection of fine handcrafted jewelry, featuring exquisite pieces that are unique, memorable, and gracefully personalized especially for your family member or loved one.